Climb aboard a longboat and get ready to go pillaging for a jackpot in Viking’s Treasure, a Norse themed video slot from Scandinavian developer Net Entertainment. This epic adventure comes with a bonus feature that awards up to 30 free spins where all payouts are trebled. Start your quest from between 30p and £37.50 per spin. NetEnt don’t do ugly looking games – Viking’s Treasure may not be the best that the developer has come up with as far as visuals go but it’s still above average compared to what’s on offer from many competitors. The symbols on the reels have a cartoon feel and include a collection of rune symbols as well as an axe, a pig-tailed Viking woman, shield, warrior’s face mask and a Viking longboat. 5 of these on a payline will see you sail off with a 1,000 coin payout. The bearded Viking warrior is the game’s wild, replacing all other symbols apart from the scatter. Land 2, 3, 4 or 5 of these anywhere on the reels and you can look forward to a payout of 10, 250, 2,500 or an eye-watering 10,000 coins! The hand full of treasure is the scatter – 3, 4 or 5 of them anywhere on the reels will get you a payout of 5, 25 or 500 times your total stake and perhaps more importantly trigger the Free Spins feature. Here you’ll be awarded 15 free spins. The coins can quickly build during the feature as all winning combinations are boosted by a 3x multiplier and trebled. Landing 3 or more scatters during the feature will see another 15 free spins added to you tally. On the variance scale, Viking’s Treasure is in the medium range. Expect some lean spells when the virtual pillaging will come to very little. The free spins aren’t the easiest to trigger but can pay dividends thanks to the multiplier. There are wins of up to 2,404 times your stake though to make it worth your while. 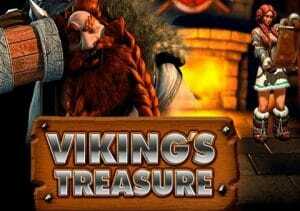 Viking’s Treasure is one of NetEnt’s older video slots and what it lacks in graphical sophistication it makes up for with a nice free spins feature. The visuals are perfectly serviceable mind you and the haunting soundtrack matches the epic theme. Simple it may be, especially for a NetEnt powered game, but Viking’s Treasure remains a playable one. Get lucky with the feature and these Norse warriors could yet help you make off with plenty of treasure. It’s been said that this game is NetEnt’s answer to Microgaming’s Thunderstruck which also has a Norse mythology theme and a very similar bonus feature.